As the weather warms up, migratory birds begin making their way back to and through Kansas. The state is on the Central Flyway, a migratory route between the Gulf of Mexico and central Canada. Some great spots to check out the birds are wetland and marsh areas, like Baker Wetlands near Lawrence, Quivira National Wildlife Refuge near Sterling, and Cheyenne Bottoms near Great Bend. Year round, you can check out Baker Wetlands and QNWR on foot with trails featured in the upcoming Kansas trails guidebook, and to explore Cheyenne Bottoms, you can go on a driving tour. 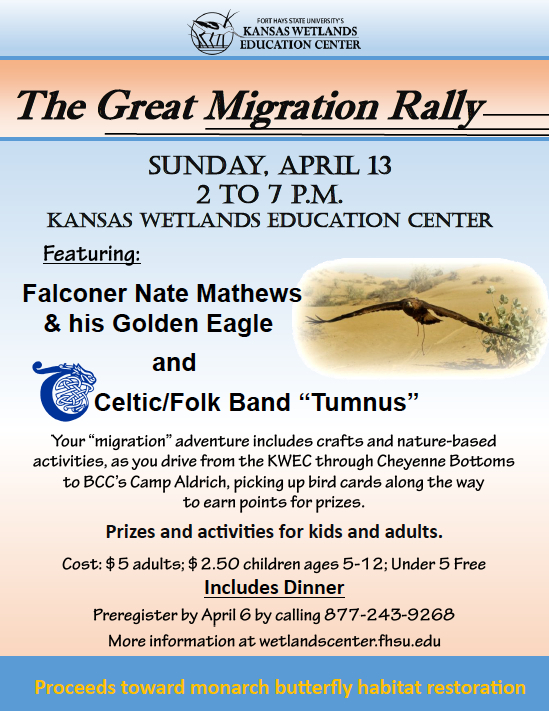 And in celebration of the spring migration, on Sunday, April 13, 2014 from 2pm to 7pm, Fort Hays State University’s Kansas Wetlands Education Center is hosting the Great Migration Rally. Participants start off by drawing a “bird” card, worth so many points. The rarer the species, the more points it is worth. “Each bird is a species that migrates through Cheyenne Bottoms,” Curtis Wolf, KWEC manager, said. …There are also crafts for kids and adults, with kids making a bird feeder to take home. In addition, Bird Bingo, bird tattoos and other activities will be available. A comfort meal of ham, macaroni and cheese, green beans and biscuits will be served, with Tumnus, a trio from Wichita, providing Celtic and folk tunes. Cost for the event is $5 for adults, $2.50 for children ages 5-12 and free for children under age 5. Proceeds from the event to restoring monarch butterfly habitat, another species that wings its way through Kansas. Participants are asked to pre-register by calling the KWEC, 1-877-243-9268, or emailing lkpenner@fhsu.edu, by April 6. More information is available at wetlandscenter.fhsu.edu.